The Luzon A cluster moved to extend the quantitative restriction (QR) on rice for another two years subject to the impending expiration of the waiver on the special treatment on rice in 2017. Key rice industry players from the government, private sector, and other concerned organizations formulated unified inputs that can help the government in coming up with its position on the expiration of the waiver during the first leg of cluster-wide consultation on rice QR on September 22, 2016 at Hotel Stotsenberg, Angeles City, Pampanga. Representatives from the Department of Agriculture Regional Field Offices (DA RFOs), local government units, rice farmer organizations, business sector (including traders/millers, seed growers, and input suppliers), Regional and Provincial Agriculture and Fishery Councils (RAFCs/ PAFCs), and civil society organizations engaged in rice industry development participated in the said event. The cluster-wide consultation was undertaken by the DA through Philippine Council for Agriculture and Fisheries (PCAF), Policy Research Program (PRS) and National Rice Program to present the policy options that the government has on the expiration of the waiver on the special treatment on rice and to discuss the possible consequences that may arise from the government’s policy choices. The first option is to secure another waiver while the second option is to tariffy. Should the government wished to take the first option, it will provide concessions in exchange for another QR extension. “If tariffication will be the chosen option, the tariffs that will be collected from the imports should be earmarked to serve as additional funding support to the programs of the government to help the rice farmers to increase their competitiveness,” one of the panelists suggested during the open forum. According to Cabuños, if tariffication will be selected, there are three more choices that the government need to consider. First, tariffy based on the formula: higher internal price, lower external price = high tariff equivalent; second, tariffication plus upward adjustment of tariff equivalent; and third, tariffy plus negotiate with ASEAN member states. The discussions were also focused on how our country can produce products with the same quality as the competitors but less expensive. Among the recommendations were increase rice yield by using hybrid rice, reduce production cost especially labor by increasing mechanization level, reduce marketing cost and margin, increase efficiency of rice mills by increasing capacity utilization, reduce transport cost by improving transport networks and reduce marketing layers to minimize margins by having wholesale markets. The second leg of the cluster-wide consultation will be held on Hotel Rembrandt, Quezon City on September 28, 2016. Signed and sealed. 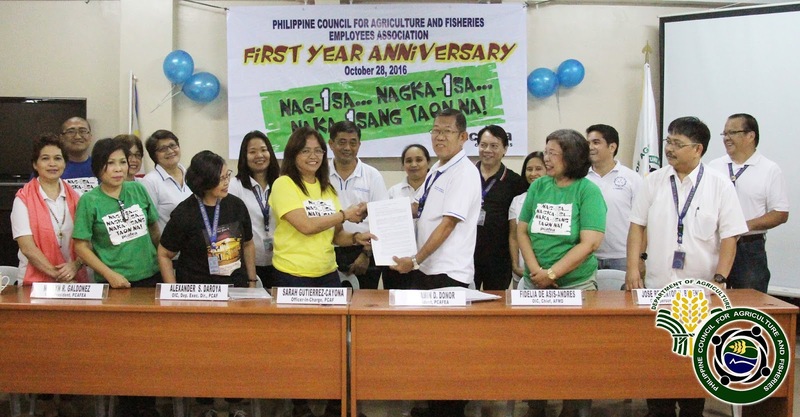 Philippine Council for Agriculture and Fisheries (PCAF) OIC Sarah Gutierrez-Cayona signed the Collective Negotiation Agreement (CNA) during the PCAF Employees Association’s (PCAFEA) first anniversary celebration on October 28, 2016. The CNA encapsulated collective negotiations between PCAF and PCAFEA, the duly organized employee’s association of the agency. Among the provisions included in the agreement consist of the shared responsibility and account and decision making on promotion and career advancement; acknowledgment of the right of the association to check-off from the salaries of the employees or members’ loan, union dues and other contributions; grievance machinery and dispute resolution; employee’s benefits program; safety, health and work environment; professional growth development; and CNA incentive, sources and cost-cutting measures. 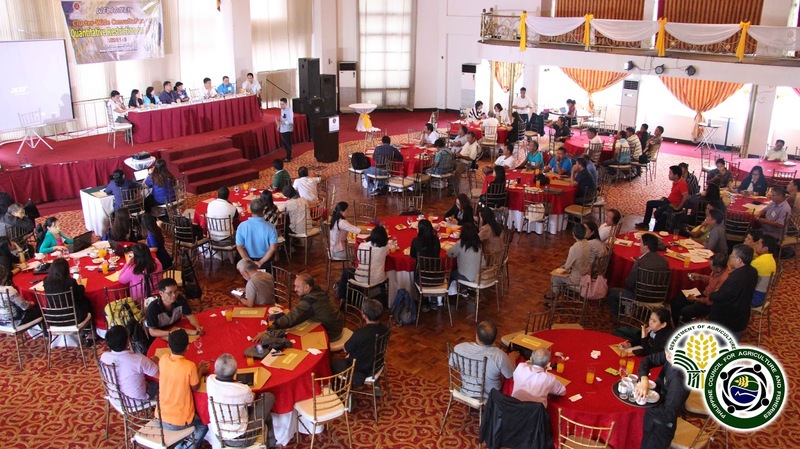 Representatives from the concerned Department of Agriculture (DA) Regional Field Offices (RFOs), LGUs, rice farmers’ organizations, traders/millers, seed growers, input suppliers, Agricultural and Fishery Councils (AFCs), National Sectoral Committees (NSCs), and civil society organizations during the panel discussion. This is the stand of vice chairperson of National Sectoral Committee - Committee on Food Staples Romeo Royandoyan during the second leg of the cluster-wide consultation on rice QR on September 28, 2016 at Hotel Rembrandt, Quezon City. Organized by the Department of Agriculture (DA), through Philippine Council for Agriculture and Fisheries (PCAF), the series of cluster-wide consultations aimed to gather inputs from rice stakeholders all over the country to help the government on what policy option they may take in relation to the impending expiration of the waiver on the special treatment on rice in 2017. The first option is securing another waiver while the second option is to tariffy. According to Marlito Cabuños of Policy Research Service (PRS), if the second option is chosen, there are three more choices to be considered. First, tariffy based on the formula of tariff equivalent; second,tariffication plus upward adjustment of the tariff equivalent; lastly, tariffy and negotiate with ASEAN member states. “Kung ako po ay kagaya nung kay Sec. Piñol na bigyan ng 2 taon pa para patunayan na kaya nating makipag-compete. Ang pwede nating gawin ay gumamit ng mechanization to improve yield. PHILMECH ay nagtuturo kung paano gumamit ng rice transplanter,” a panelist from PHILMECH said. The undertaking also primarily aims to discuss the possible consequences that may arise from the government’s policy choices. “This is a critical event for us because as a developing country, we also need to counterbalance the advantages and disadvantages of the decision that we will pursue,” PCAF Officer-in-Charge Executive Director Sarah Gutierrez-Cayona said on her opening message. The discussions were also focused on different factors such as seeds, credit, irrigation, marketing, land conversion, crop insurance, funding, and subsidy on fertilizer. Preceding the Luzon B cluster consultation is the Luzon A-wide which was held in Angeles City, Pampanga on September 22, 2016. The Visayas consultation will be held on October 5, 2016 at Iloilo City. Photo shows PCAF OIC Director Sarah Gutierrez- Cayona, together with PCAF staff as they take part in the 2016 World Food Day Celebration. Second photo shows PCAF’s flag bearer (3rd from right) lining up with other flag bearers of the bureaus and agencies of the Department of Agriculture during the opening program. The Philippine Council for Agriculture and Fisheries (PCAF) reiterated its commitment to eradicate hunger and poverty worldwide as it joined the World Food Day (WFD) Culminating Program in Liwasang Aurora in Quezon City on October 14, 2016. Led by PCAF OIC Director Sarah Gutierrez-Cayona, almost 90 employees participated in the event with the theme “Climate is changing. Food and agriculture must too”, a global call to strengthen climate action plans and invest in rural development to address the adverse effects of climate change. Established by the Food and Agriculture Organization (FAO) member countries, WFD is observed annually in more than 150 countries across the world. Also part of the celebration was the awarding of Outstanding Rural Women and Young Artists for the on-the-spot poster-making contest. Present in the awarding were Quezon City Mayor Herbert Bautista, Department of Agriculture (DA) Undersecretary for Administration and Finance Bernadette Romulo-Puyat, other officials from DA, and executives from the United Nations and FAO. PCAF and the entire family of DA also joined the candle-lighting ceremony while reading the 2016 WFD Pledge. Bridging Linkages. Along with more than 400 exhibitors from the agriculture and fisheries sector, the Philippine Council for Agriculture and Fisheries (PCAF) joined anew in the 2016 AgriLink/FoodLink/AquaLink on October 6 to 8, 2016 at the World Trade Center in Pasay City. The three-day event gathered more than 25 thousand visitors and focused on the resiliency of agriculture sector, especially in agribusiness and livestock production of the newly formed Negros Island Region. The exhibit provided an opportunity for PCAF to showcase its mandate where it establishes a nationwide network of agricultural and fishery councils to serve as the forum for consultative and continuing discussions with the agriculture and fisheries sectors. Photo 1 shows AgriLink’s Foundation for Resource Linkage and Development president and PCAF’s National Sectoral Committees and Strategic Concerns Committees member Antonio Roces (left) explains to Department of Agriculture (DA) Secretary Emmanuel Piñol (2nd left) the importance of PCAF in ensuring the success of DA’s programs and projects. Also, photo 2 shows a PCAF employee talks to a group of farmer-entrepreneurs from Batangas City about PCAF and its Advisory Special Bodies. To strengthen partnerships and linkages with the stakeholders, the Philippine Council for Agriculture and Fisheries (PCAF) supported the SOCSKSARGEN Federation of Fishing and Allied Industries, Inc. (SFFAII) through its participation in the 18th National Tuna Congress Trade Exhibit on August 31 to September ­2, 2016 at the SM Trade Halls in General Santos City. SFFAII is an active member of National Sectoral Committee - Committee on Fishery and Aquaculture (NSC - CFA) since 2005. The PCAF exhibit highlighted the NSC - CFA and its 2015 achievements through resolutions which organized and strengthened the fishery and aquaculture industry. For the three-day exhibit, more than 70 guests visited the booth and composed of students from Mindanao State University – College of Fisheries, local government units of General Santos, DA Regional bureaus and attached agencies, private sectors and academicians from neighboring Southeast Asian countries like Thailand. 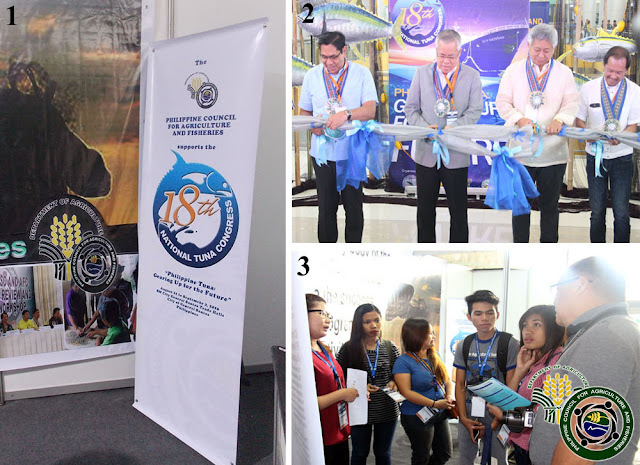 Organized by SFFAII, this year’s exhibit with the theme “Philippine Tuna: Gearing Up for the Future” provided a venue and allowed more time to almost 80 local and international exhibitors featuring their several product lines and services of tuna and allied industries. Photo shows (1) a part of the PCAF exhibit area, (2) General Santos City Mayor Ronnel Rivera, Department of Trade and Industry (DTI) Secretary Ramon Lopez, SFFAII President and Congress Chairperson Joaquin Lu, and DTI Region 12 Director Ibrahim Guimadel cut the ceremonial ribbon to open the trade exhibit and (3) PCAF staff orienting their guests about the agency and its consultative bodies. For continuity in handling the forthcoming discussions on the Philippine’s rice quantitative restriction (QR) in World Trade Organization (WTO), National Sectoral Committee – Committee on International Trade (NSC-CIT) members appealed for Ambassador Esteban Conejos, Jr.’s retention as the permanent representative of the Philippines to the WTO. Amb. Conejos was appointed as the permanent representative of the Philippine Permanent Mission to the WTO by the former President Benigno S. Aquino III on July 2012 and has been reappointed two years further after his first term expires. As the new administration comes, Amb. Conejos has been recalled to the Philippines from its base in Geneva, Switzerland effective June 30, 2016. The recall of Amb. Conejos crippled the operations of the Philippine Mission to the WTO in Geneva because of the absence of our country’s representative in significant meetings and negotiations with other parties particularly to the rice QR. QR is a trade restriction placed on the amount of goods that can be imported into a country and this protects the price of domestically produced goods or to decrease or eliminate a trade deficit. The Philippines has secured a waiver on its WTO obligation to tariffy rice in 2014. Currently, it was allowed to retain the rice QR until June 30, 2017. To address the issue of country’s rice QR and absence of representative to WTO, series of meetings have been conducted by the Philippine Council for Agriculture and Fisheries (PCAF) - CIT. Ambassador Esteban Conejos, Jr. tackles the matter on the country’s rice QR in one of the meetings of NSC – CIT at PCAF Conference Room in Quezon City. In photo, from left, Former DA – Chief of Staff Atty. Dennis Guerrero and NSC-CIT Chairperson Raul Montemayor. Aside from Amb. Conejos, present in the meetings were Charge d’ Affaires to the WTO, Geneva, Switzerland Consul Ryan Gener; Philippine Agricultural Attaché to Geneva, Switzerland Jerome Bunyi; Undersecretary for Policy and Planning Segfredo Serrano; former DA Chief of Staff Atty. Dennis Guerrero; NSC-CIT Chairperson Raul Montemayor; PCAF employees; members of the CIT and chairpersons of each NSCs. After thorough discussions, the CIT members passed a resolution requesting the Department of Agriculture (DA) Secretary Emmanuel Piñol to endorse to the Department of Foreign Affairs (DFA) Secretary Perfecto Yasay, Jr. and President Rodrigo Duterte to retain Amb. Conejos as the country’s permanent representative to the WTO. According to the resolution signed by NSC-CIT chairperson Raul Montemayor, Amb. Conejos is in the best position to handle the upcoming discussions on the rice QR because he has been consistently involved in various activities in the WTO and proficiently developed effective working relationships with WTO member. “Philippine Mission, headed by Amb. Conejos, is already doing the groundwork for the negotiations involving either the lifting of the QR by 2017 or extension of the waiver,” the CIT members added in the resolution. It also stated that it may take a while before a new ambassador can be appointed to the WTO and it would even take more time for the newly appointed ambassador to understand the complexity of the issues being discussed in the WTO.